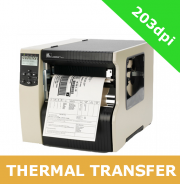 Zebra 220Xi4 industrial thermal transfer label printers for sale. The Zebra 220Xi4 label printer is designed for fast printing of chemical drum and other wide-label applications. Count on high performance when you trust the rugged reliability of this thermal transfer label printer. The Zebra 220Xi4 printer is available in either 203dpi or 300dpi resolutions and comes with serial, parallel, USB 2.0 and ZebraNet 10/100 PrintServer as standard. It has a maximum print width of 216mm.